Welcome to my world. It is a place where nothing is impossible, where creativity is more than just a word and where challenges are meant to be taken. In the month of January of this year, a new opportunity knocked my door. It was something very different and the prospect of taking this new challenge was exciting for me. It was about writing a weekly column in the Marathi newspaper, Maharashtra Times. When everyone was still busy with writing new year resolutions, I made myself busy with writing something else. Articles. Every week, Thursday to be precise, my article of around 500-600 words would be published! The theme of my articles would be Chess and life of a sportsperson in general. After successfully writing thirty-five articles in Maharashtra Times, today I want to take a look back and share my experience. I started writing from the first week of January, this year. When I started writing, I was told that I could write as long as I would like to and as long as it is possible for me. Even though I was happy to get this opportunity, I was also a little skeptical about my writing skills in Marathi. But as I made a start at writing this column, it became less difficult and more interesting. I realized that it is not just about writing but more about sharing my thoughts and experiences. Below is the sample of one of my articles. Through my articles, I tried to cover various topics. From the responses that I received, I feel that my articles might have helped in generating interest about Chess in local people. This was my first time of writing regularly for any newspaper, and before this I had always wondered how the authors submit their articles and how it gets published on time. But the process turned out to be very simple. Since my column came out every Thursday, I had to submit my article around Monday-Tuesday. The process is I have to write, then take a scan copy or a photograph of the paper and email it! I received a lot of positive feedback throughout the time I was writing. Thank you for your wishes and appreciation for my articles. I remember this particular incident. One August evening, I heard a knock on my front door. When I answered I saw a person with a big bouquet of flowers. I did not know this person and therefore I inquired. He replied that he is just one of the readers, who had stopped by to congratulate me and meet me in-person. He went on to suggest me to write a book! In the column beneath every article, there was my name followed by my email Id. I never thought that people would actually care to send an email to give feedback. But it happened that they did, and to be honest it is great to receive these emails from the 'readers'. Here I would like to share few of the many feed-backs that I received through email. 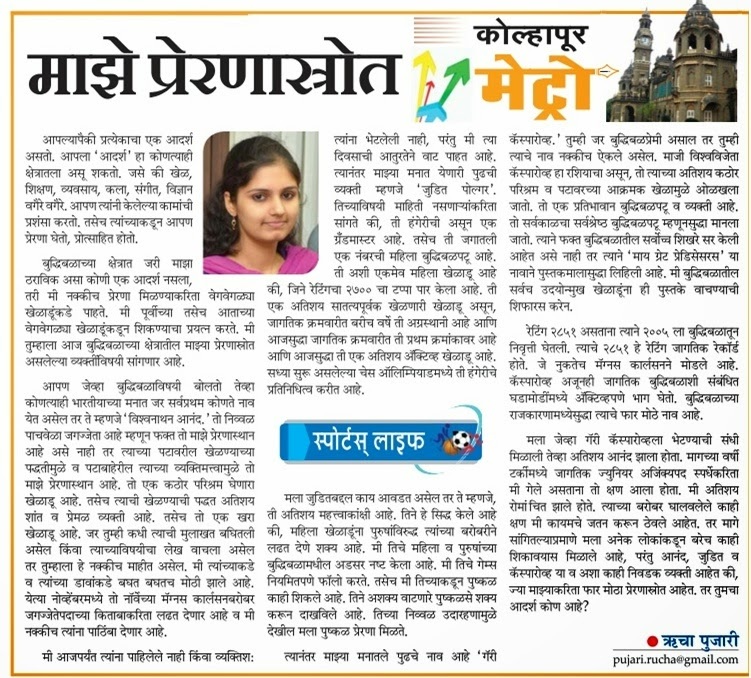 I would like to thank Maharashtra Times for giving me this opportunity and space to express my thoughts and ideas. It was a wonderful experience not only because I got a platform to share but also because I got a medium to connect with the audience. I also want to thank my parents for always encouraging me in whatever I do and for being there whenever I needed any help. 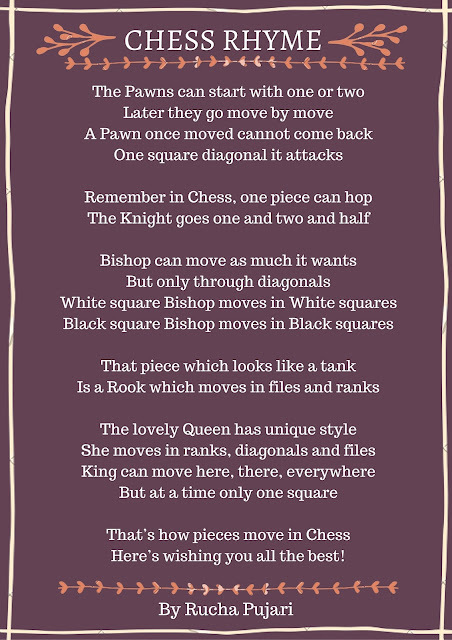 After completing thirty-five articles, I feel satisfied that I have been able to publicize Chess in my own little way. There is always a sense of pride when our work gets published, especially considering the amount of 'GBs' that is invested on it. "With the new day comes new strength and new thoughts." Ruchess. Ethereal theme. Powered by Blogger.